I dip, you dip, we dip! Or rather I don’t know what you’re dipping into but I’m dipping into some FOODS. Luna Grill gave me an invite to come in and check out their new Dip Trio and I gladly said yes because I don’t say no to hummus. This is Luna Grill’s new Dip Trio! You get three dipping sauces along with some fresh veggies and pita bread. The big pool of white stuff is their new Garlic Sauce and it is HEAVENLY. It’s a bit looser than the other two but it’s got a good garlic flavor without being spicy (which sometimes happens with too much garlic). I ended up putting garlic sauce on like… everything… my chicken kabobs, the hummus, the veggies, a little salad… I swear that garlic sauce can go on everything! Right above the garlic sauce and in the middle is the Spicy Feta. It wasn’t really that spicy and it has a bit of a chunky texture. It was my least favorite of the bunch and my lunch parter in crime, Cris, didn’t really seem to eat it either. It didn’t really taste like feta to me… and it had some semblance of a flavor… but I just wasn’t into it. We left the Spicy Feta all sad and alone on the plate when we wrapped things up to go. Sorry, Spicy Feta. We just didn’t love you like you deserved. The hummus is their normal hummus which I enjoy because I like hummus. If you were wondering, why yes, I was trying to say hummus a lot in one sentence. I succeeded. Go me! Cris commented that she would probably just order the Dip Trio alone and eat it as a meal. 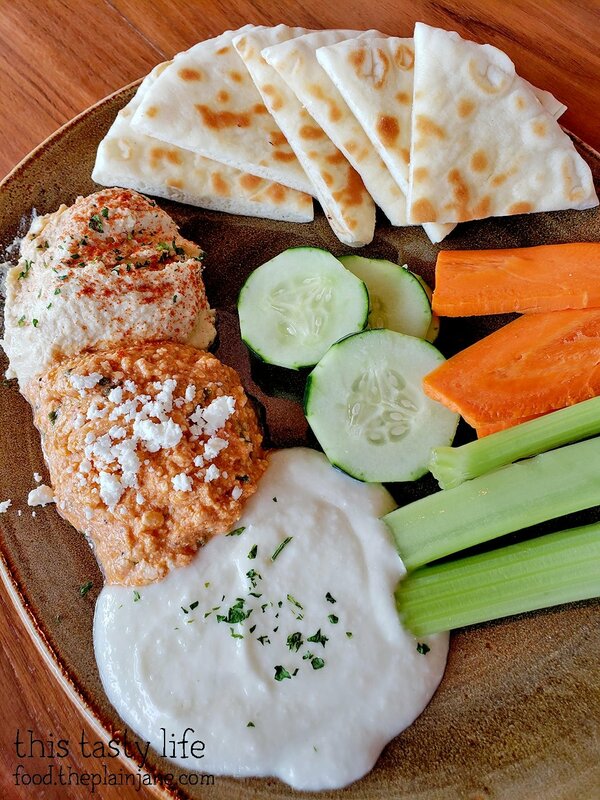 It could easily be a vegetarian plate of food with the dips, veggies, and pita bread. We also were able to try a couple of chicken kabob plates. 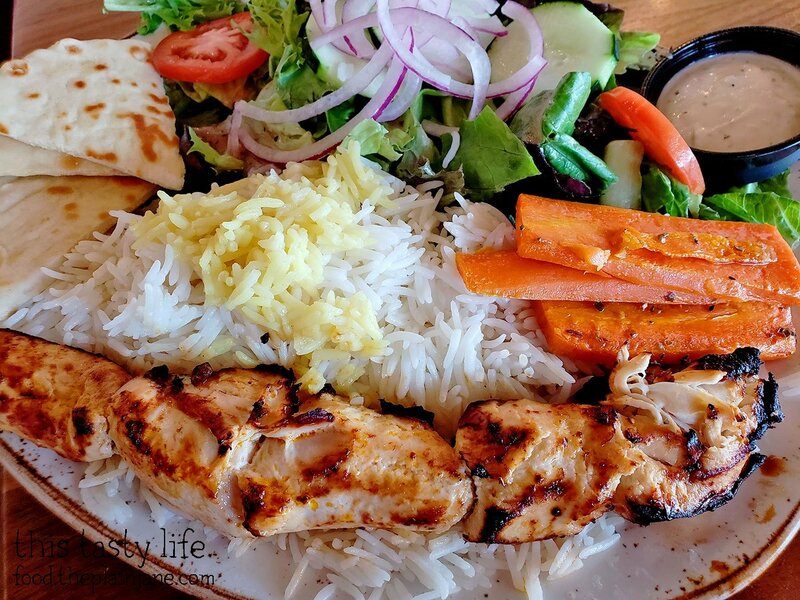 Cris chose the Flat Cut Chicken Kabob Plate. 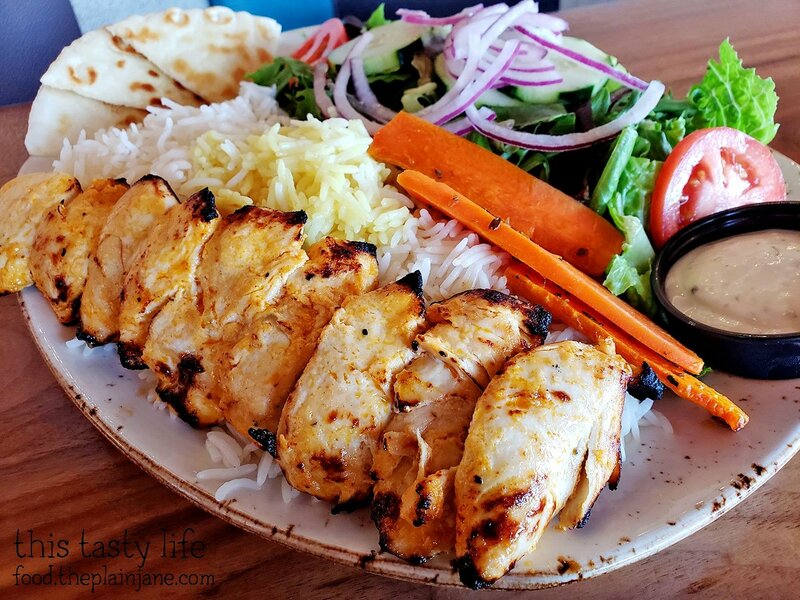 The menu states that this chicken is thinly sliced but otherwise seems to have the same seasoning as their regular chicken kabob plate. I did have a little taste and it seemed to be a quite juicy and succulent. I got the normal, regular old Chicken Kabob Plate which I guess comes with fatter pieces of wasn’t-cut-thinly chicken. The pieces do look chunkier and had a bit more of a flamed edge to them. They were a bit drier than the fancy flat cut chicken but it was fine. I didn’t complain. It still tasted okay… but for future visits I may get that flat cut chicken instead… it was a lot juicier than this chicken! The nice thing about Luna Grill is that it’s a hefty portion. I actually only eat half (all of the salad and some chicken) and then take the rest home for another meal. Two meals in one! And that’s all I have to say about that. Thanks to Luna Grill for hosting us for dips and chicken kabob plates! Disclaimer: I was invited to dine at Luna Grill and our meal was complimentary. I was not further compensated for this post and all opinions stated here are my own. I feel so popular and honored! …which reminds me I still have my leftovers in the work fridge. O_o.